If the connection seems loose, please try to push the connector a little harder with force. Let your stress melt away with the help of this versatile Cordless Shiatsu Massage Pillow! Designed to target troublesome spots in your neck, lower & upper back and shoulders, the pillow features 8 deep-kneading Shiatsu massage heads with silicon gels to soothe and invigorate sore muscles for better massage experience. 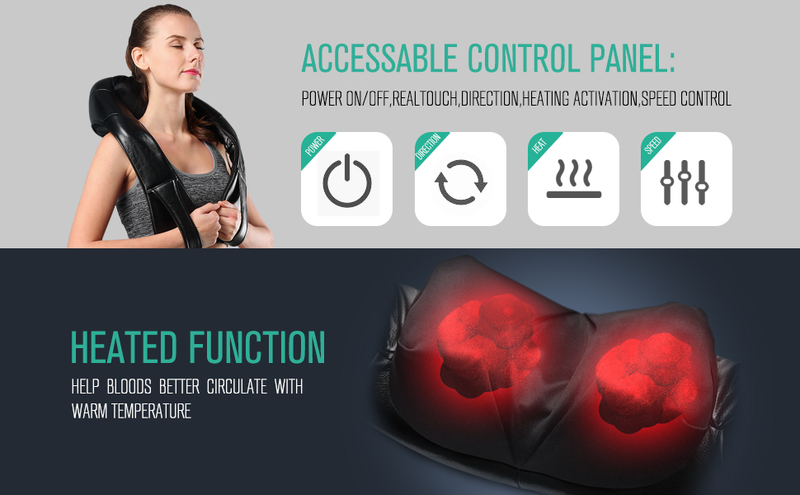 What makes it more convenient to use is that this awesome massager is cordless and has a rechargeable battery which lasts up to 90 minutes of usage. No more annoying cords and wires while using the massager. Use it with ease and comfort! PLUS, select massage with or without heat for added comfort and have control which direction it goes with its bi-direction options. Its ultrasoft fabric provides a soothing surface that is gentle to your skin. Relieve your stress from work, school or any other exhausting activities with this great deep-kneading shiatsu massage pillow. The massager hurts me and I feel pain while using it, what can I do?